The article was published in Washington Post on Sunday, August 7, 2005. Here Rushdie's view point is interesting. Following is some selected passages which are quite thoughtful. ... "It should be a matter of intense interest to all Muslims that Islam is the only religion whose origins were recorded historically and thus are grounded not in legend but in fact. The Koran was revealed at a time of great change in the Arab world, the seventh-century shift from a matriarchal nomadic culture to an urban patriarchal system. Muhammad, as an orphan, personally suffered the difficulties of this transformation, and it is possible to read the Koran as a plea for the old matriarchal values in the new patriarchal world, a conservative plea that became revolutionary because of its appeal to all those whom the new system disenfranchised, the poor, the powerless and, yes, the orphans. Muhammad was also a successful merchant and heard, on his travels, the Nestorian Christians' desert versions of Bible stories that the Koran mirrors closely (Christ, in the Koran, is born in an oasis, under a palm tree). It ought to be fascinating to Muslims everywhere to see how deeply their beloved book is a product of its place and time, and in how many ways it reflects the Prophet's own experiences. However, few Muslims have been permitted to study their religious book in this way. The insistence that the Koranic text is the infallible, uncreated word of God renders analytical, scholarly discourse all but impossible. Why would God be influenced by the socioeconomics of seventh-century Arabia, after all? Why would the Messenger's personal circumstances have anything to do with the Message? 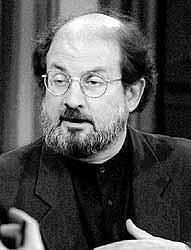 Tag: Salman Rushdie, Islam, Quran, Koran.